Procurement, supply chain, and finance professionals each have their own individual perspective on when, where, and how supply chain finance can be used. Here we take a broader perspective and approach, 'holistic supply chain finance' and discuss the potential it holds. In most companies, supply chain finance is seen as a narrow and limited tool rather than a strategic enabler of success. As a result, a lot of unrealized value is left on the table. Whether you are in finance, supply chain, or procurement, supply chain finance has the potential to help you provide more strategic value (see sidebar, “Three Roles, Three Perspectives, Three Potentials”). Supply Chain—The supply chain executive often views supply chain finance (SCF) as primarily a financial function. In fact, SCF has the potential for assuring continuity of supply, making the supply chain more agile, and bringing down total costs. Finance—The treasurer or financial executive may not fully appreciate the important role SCF can play in cash management. Procurement—To many procurement professionals, all the ‘glory’ is in the sourcing phase. Once they’ve found the right supplier and negotiated the right deal, then the rest of it is considered to be just tactical execution. They may not recognize how much SCF can do to help improve suppliers’ performance and financial health. Because of this mindset, most manufacturers and retailers miss out on a lot of the value potential of supply chain finance, particularly when it comes to procurement of direct materials. In fact supply chain finance, done right, can generate strategic value throughout the P2P lifecycle, particularly in assuring continuity of supply, reducing COGS,1 meeting profitability targets, creating more sustainable supply chains, and reducing time-to-market and lead times. Here we explore how taking a holistic approach to supply chain finance, underpinned by a foundational network platform, enables companies to obtain this strategic value. In the first three articles of this series, we will explain the concept of holistic supply chain finance and network platforms. The final two articles in the series provide a description of the core foundational capabilities required of an organization to implement holistic supply chain finance, as well as the benefits that are being achieved by companies taking a more holistic approach to supply chain finance. Full Life-cycle SCF—End-to-end supply chain financing, across the entire P2P order lifecycle includes pre-shipment, post-shipment, and post-invoice financing options for suppliers. Networked SCF—A unified and connected network of trading partners includes and connects all parties participating in the various transactions and the management and movement of goods, throughout the end-to-end P2P lifecycle. The network should enable interparty collaboration, support automated workflows, and provide tools to help suppliers achieve high levels of compliance in pick, pack, ship, and fulfillment-related data/documentation. We explore both facets of holistic SCF below. Many people equate supply chain finance only with indirect procurement, and/or only with providing suppliers with early payment programs, or the ability to sell or borrow against their receivables (i.e. factoring or reverse factoring). These are important components, but there are also significant opportunities for improving financing at each stage in direct materials procurement throughout the P2P process, such as pre-shipment and post-shipment financing. Many buyer firms consider earlier financing to be the suppliers’ headache. As a result, those buyers miss out on the many benefits that can be obtained by helping their suppliers who need cash earlier in the cycle. Of course suppliers may already be able to borrow money at various stages using traditional means … but often at prohibitive interest rates. In particular, smaller suppliers in emerging markets often have tremendous difficulty accessing affordable capital. This creates all kinds of inefficiencies, delays, and extra costs in the supply chain. However, when lenders can be provided with A) much better visibility into progress on the ground against actual milestones for each order and B) an agreed system and legal framework that provides them date-certain confidence in getting paid, then it lowers their risk considerably. This dramatic reduction in risk translates into a much lower cost of capital. Injecting affordable capital into the supply chain at these various points in the cycle, when and where it is most needed, can be transformative. It lowers end-to-end costs; enables suppliers’ growth and health; helps buyers effectively leverage early payment discount programs; creates more opportunities for lenders to provide financing earlier and longer; and gives suppliers many more choices (from more lenders and hence more competitive rates) for their financing needs. In this paper, we will discuss how these capabilities can be made available to lenders, buyers, and suppliers. Many different parties participate in the end-to-end P2P order lifecycle, including the buyer, seller, transportation carriers, brokers and forwarders, customs agencies, private inspection firms, banks and other lender financial institutions, and others. To provide the type of holistic visibility described above in a feasible and cost effective manner, it requires connecting all of these participating parties on an underlying unifying network. This network must provide a real-time single-version-of-the-truth, based on reliable capturing and reporting of actual events on the ground as they happen. It also requires a multi-enterprise workflow capability that drives timely assignment and completion of various tasks, immediate delivery of information, and instant alerts when there are issues that need attention. 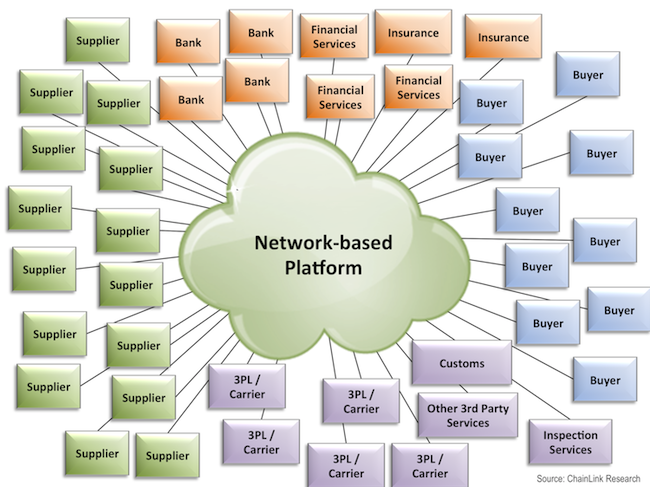 Once this type of holistic, end-to-end network is in place, a wide array of dramatic improvements to supply chain finance (and operational performance in general) become possible. In Part 2 of this series, we explore some of these, including how holistic SCF helps lower risk, cost of capital, and COGS, all of which contribute to higher margins.